One wishes a newlywed couple many, many festive Shabbat and holiday meals together and surrounded by loved ones. What could be a better wedding gift than a Kiddush cup and saucer set, handcrafted in the finest 925 sterling silver? Israeli Judaica designers Hadad Silversmiths have created this Kiddush cup and matching saucer in the best tradition of silver Judaica. 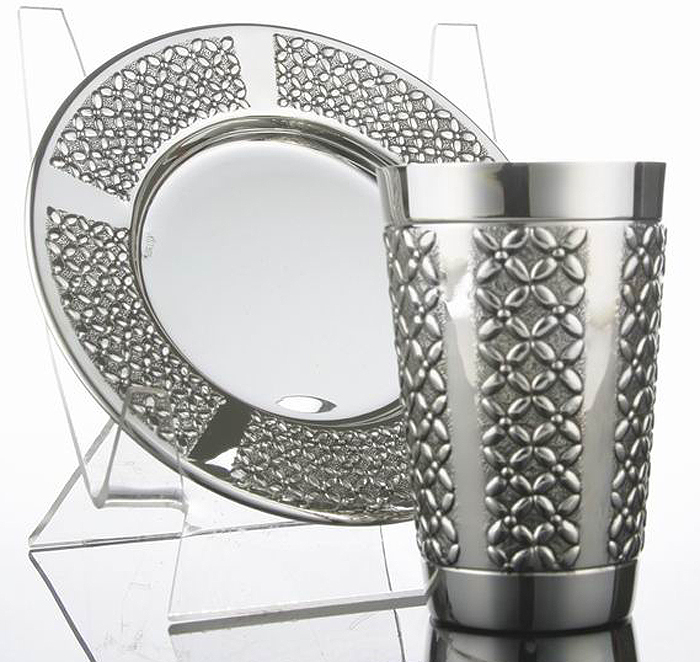 The silver cup is decorated around its flat bottom with panels of raised lattice design alternating with smooth polished silver. The Kiddush cup's rim has a straight-edged finish over a polished smooth band. Matching panels of raised tight lattice designs circle the saucer's rounded edge. The Kiddush cup holds the Shiur (halachic amount) of wine required by Jewish law to recite the Kiddush blessing. As only Jewish artisans created this item, there is no need to Tovel it (immerse it in a mikvah). This handcrafted silver Judaica Kiddush cup and saucer set is a wedding present that will be an ornament to any Jewish home and be passed down for generations.